The Tacoma Narrows Monochord from Puget Sound is by UCSD alumni Sean Griffin (Ph.D. Composition '03) and Aiyun Huang (MA '98, DMA '04) and the performance closes out the Qualcomm Institute's 2014 IDEAS performance season. In the Puget Sound’s Deception Pass is a small island known as Ben Ure Island. Ben Ure and his partner Lawrence Kelly would smuggle Chinese laborers into the Puget Sound, hiding them in burlap bags on their ship. When the US Customs Department would catch them, they would dump the bagged-up people into the water to avoid fines. Because of the currents, the bodies would collect around San Juan Island in a cove that is still called Dead Man’s Bay. In Griffin’s narrative, The Puget Sound, from which this work originates, Chang’e, the Chinese moon goddess with her rabbit, embodied by Huang, tears down the Tacoma Narrows Bridge (collapsed in 1940) after saving the souls of the drowned people and returning them to their lives in an parallel reality. The drumming of fingers represents an impatient gesture for justice and the monochord instrument represents the suspension bridge collapsed into a box. Tacoma Narrows Monochord from The Puget Sound is a new percussion theater and media performance work that instrumentalizes archival footage and historical narratives related to the Puget Sound in Washington State. This multi-movement “pocket media-opera” features 20 video, sound and movement interactions. The video consists of archival footage from the Wende Museum and Archive of the Cold War, footage of the Tacoma Narrows Bridge collapse and of Aiyun Huang in 8 separate costumes designed for the piece. Vivid juxtapositions are spun into an imaginary theater work of poetic quotation construed of intimate home-movies, civil engineering disasters, American-Chinese labor histories, poetry and a moon goddess with a rabbit. At the center of the work is Huang playing a new sculptural soundbox instrument. Wired with tense strings and electronics, it emits shifts in highly-refined finger percussion techniques and exploits the strings’ resonant properties through extended, electronically enhanced drones. Conceived by long-time collaborator, composer/director Sean Griffin, the work was commissioned by Huang and emerged through collaborative, interdisciplinary development with sound designer Chris Warren, cognitive neuroscientist John Iversen and artist Joe Yorty. Tacoma Narrows Monochord is an interactive, research-based musical-and-video landscape that compiles fiction, history, and musical feats into a suite of seemingly unrelated but surprising, historically entwined realities. After the performance, audience members are welcome to try to prevent the bridge collapse by interacting with the gaming element of the piece. The performance in the Calit2 Theater will take place on the final day of the team's five-day residency in the Qualcomm Institute. Los Angeles composer and director Sean Griffin’s works range from instrumental compositions to immersive operas, installation, rhythmic games and movement patterns. His performance compositions often feature the unique talents of the instrumentalists and performers with whom he collaborates extensively. In addition to recording and performing as a pianist, harpist, conductor and arranger, he is the Director of Opera Povera, an interdisciplinary consortium devoted to the creation and performance of new operatic and interdisciplinary works for which he received a grant from the Center for Cultural Innovation in 2011. In 2014, he was a Mellon Fellow for Arts Practice & Scholarship at the University of Chicago’s Gray Center for Arts and Inquiry. Griffin has received numerous residencies including at Yaddo, MacDowell, and two research and production-based residencies at EMPAC who then commissioned his large-scale, intermedia opera Cold Spring in 2010. His musical works have been featured internationally at MoMA, REDCAT, LACMA, Armand Hammer Museum, June in Buffalo, MATA Festival, Berlin’s Volksbühne, Secession Vienna, London's Royal Academy and the Tate Modern, Taipei City Arts Festival, Walker Art Center, Festival B:OM 2010 in Seoul, Korea. He received an MFA from CalArts and a Ph.D. from the University of California, San Diego. For more on Sean Griffin, Opera Povera, visit https://www.newmusicusa.org/projects/the-parable-of-otto-john/. Aiyun Huang was born in Kaohsiung, Taiwan, and holds a DMA degree from UC San Diego, where she was a Faculty Fellow between 2004 and 2006. She is an Associate Professor at McGill University in Montreal. Huang enjoys a musical life as soloist, chamber musician, researcher and teacher. She was the First Prize and the Audience Award winner at the Geneva International Music Competition in 2002, and is a researcher at the Centre for Interdisciplinary Research in Music Media and Technology in Montreal. 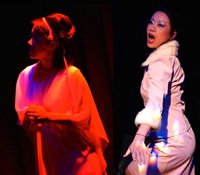 In May 2012, Mode Records released Save Percussion Theater, featuring Aiyun Huang and friends documenting important theatrical works in the percussion repertoire. Currently she leads the research project Memory in Motion, studying memory in percussion ensemble playing. John Iversen is a cognitive neuroscientist studying music and the brain, and after a decade at The Neurosciences Institute in La Jolla, Iversen is now an Associate Project Scientist in the Institute for Neural Computation and the Swartz Center for Computational Neuroscience at UC San Diego. After undergraduate studies in Physics at Harvard, Iversen received graduate degrees in the Philosophy of Science and in Speech at Cambridge, and a Ph.D. in Speech and Hearing Science from MIT. His work has focused on the study of rhythm perception and production in music and language, spanning behavioral and neuroscience approaches with the goal of understanding how we actively shape our perceptions of the world. Research topics include the role of culture in rhythm perception, whether rhythm perception is specially tied to the auditory sense, and brain mechanisms involved in generating the perceived beat in music. Iversen draws from a background in physics and neuroscience and a life-long interest in percussion, which currently finds expression through Japanese taiko drum performance with San Diego Taiko, a group that he co-founded in 2004.